On this page you can download Frybench. fryrender is an excellent benchmarking framework for anyone, not just for our customers or 3D users. Anyone out there, from hardware integrators or hardware reviewers to die-hard gamers. What makes fryrender an ideal tool for CPU benchmarking? Since its conception, fryrender has been designed with the aim of being the most muscled engine in its category. 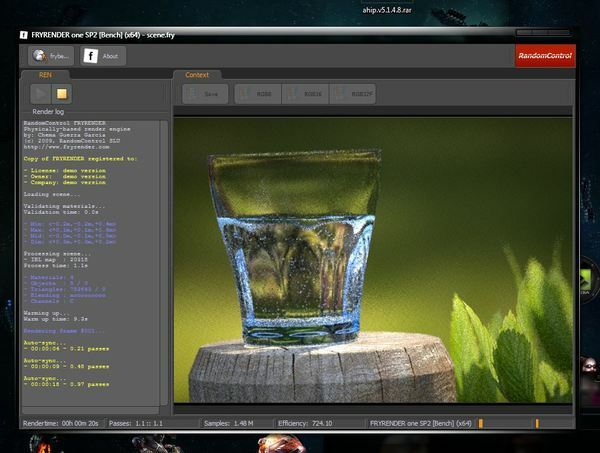 As a result, and after several years of intense development, fryrender's core doesn't let a single CPU cycle be wasted. Its routines have been written to be cache efficient, and to take the maximum advantage possible of the new multi-threading capabilities present in modern CPU architectures. We have walked the extra mile of profiling and even working at assembly level in certain areas of our rendering kernel all the way. Thus, being a highly-optimized and extremely math-intensive application (mostly in floating-point) which makes a very efficient use of the system's cache, we think that fryrender is an ideal tool for measuring 'how much brute computational power' a computer is able to deliver. Note: If you have problems downloading Frybench, please try to stop using your download manager and avoid right clicking on files. Also, check your firewall settings, because some mirrors may require that you do not block the HTTP referrers.